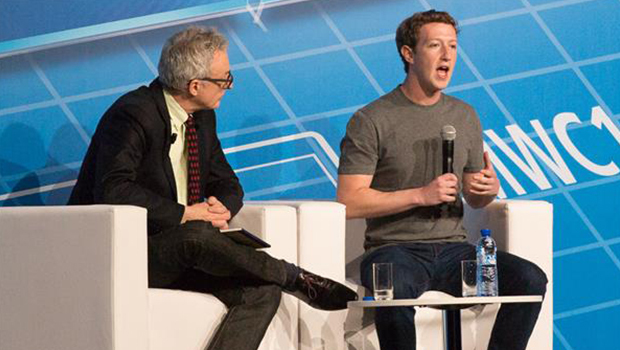 In his keynote address at Mobile World Congress on Monday afternoon, Facebook founder and CEO Mark Zuckerberg discussed his vision for “connecting the world.” The address was set up as a one-on-one interview with host David Kirkpatrick. Focusing on his foundation, internet.org, Zuckerberg spoke about the potential economic and personal gains of bringing Internet access to people around the world. "One thing that I think it's easy to take for granted is that most people in the world don't have access to the Internet at all. It's about 2.7 billion people now and it's actually growing a lot slower than you'd imagine,” he said. He cited a study that found that increased connectivity can create hundreds of millions of jobs and even decrease child mortality rates. Beyond the challenge of providing access, there is the challenge of convincing people that paying for Internet is a worthy use of their discretionary income. “Is it a gateway drug?” asked Kirkpatrick. “We think of it as an on ramp… it shows people why it’s rational and good for them to spend the limited money they have on the Internet,” Zuckerberg replied. It can increase their opportunities to find jobs, healthcare and other things that will benefit them, he said, and added that if more people are online, it will increase the profits of the companies involved, and then those companies – like Facebook -- can build out better infrastructure. That said, he added, "I think we're probably going to lose money on this for quite awhile." From there, the conversation turned to Facebook's $19 billion deal to acquire WhatsApp, the popular messaging service. Zuckerberg says the plan is for the app to continue functioning “completely autonomously,” with no changes to service. Just hours earlier, WhatsApp CEO and co-founder Jan Koum announced that the app will add voice communications in the second quarter. “WhatsApp is a great company and it's a really great fit for us... It's the most engaging app that exists on mobile that we've ever seen," Zuckerberg said. “Seventy percent of its users use it every single day… There are very few services that can reach that level, and they're all incredibly valuable." "There's two pieces to think about: the first is the company by itself and what it's going to be worth, and then there's the strategic value of what we can do together,” he said. The two also discussed the NSA’s surveillance policies. Zuckerberg said the agency was “way over the line” and not transparent enough.